Sarah LaGrece is the new manager of the School of Medicine’s Medical Education Media Center. Sarah LaGrece has been selected as the new manager of the School of Medicine’s Medical Education Media Center. She will also serve as a senior operations technician at the Clinical Training Facility. 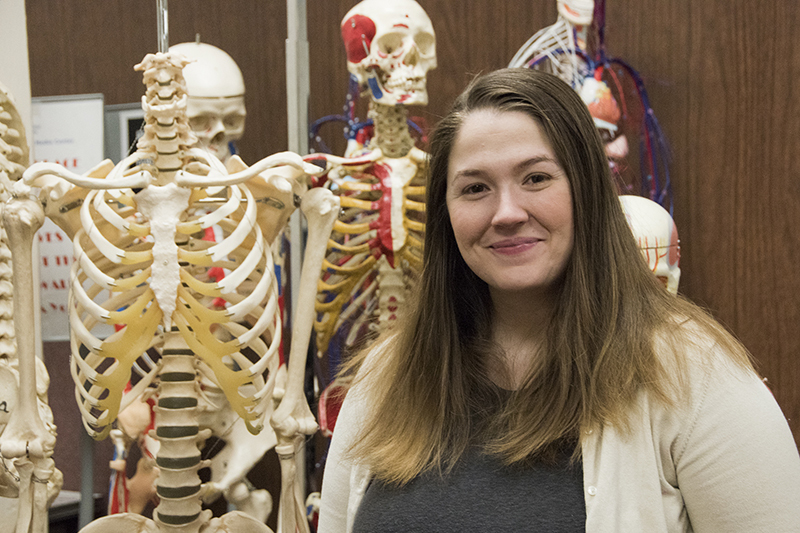 A graduate of UMKC, LaGrece will oversee the media center that serves as the School of Medicine’s instructional resource lab with anatomical models, and audiovisual and computer-based learning materials. The media center will be open from noon to 5 p.m. during the week. Students can contact LaGrece to make arrangements to use the facility outside of the normally staffed hours. School administration is exploring options to provide additional staffing to expand these daily hours, she said. In the meantime, LaGrece will be working on taking inventory, updating and repairing the models, and updating the computer software available for students, residents and faculty. Her morning hours will be spent in the Clinical Training Facility, assisting with administrative duties, simulations with the facility’s mannequins, and helping with the standardized patient program. A life-long resident of Kansas City, LaGrece graduated from Bishop Miege High School before attending UMKC and earning her bachelor’s degree in communications.